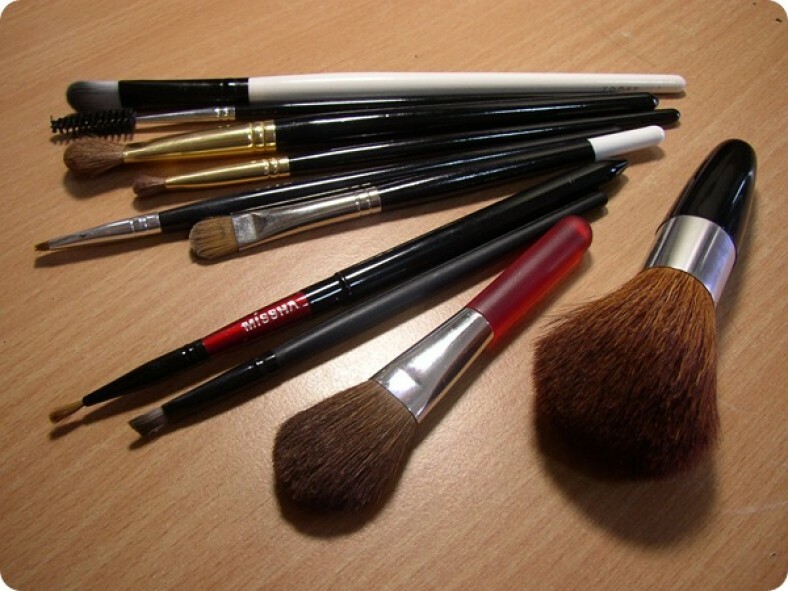 How to clean makeup brushes? Nobody wants a dirty makeup brush because it will be like pressing something full of germs over your facial skin. There are many sorts of brushes and they all get full of old cosmetics from time to time. Here is how to clean them. Method 1: Use olive oil. Get 2 spoons of olive oil and 2 spoons of anti-bacterial facewash or hand wash. Mix them in a plate and dip your used brush in them. Use your wrist to brush of the old make-up and wash your hands off with water. Put the brush down under the tap water and clean it slowly. Let them dry and make they are completely clean none of the mixture remains. There are rubber gloves or silicon small mats that people use in the kitchen mainly to handle pots. They have a strong texture with patterns that are going to get the make-up out perfectly if your wrist is not enough. Just apply on the mixture and rub on the mat or the glove. Get 2 spoons of baby shampoo and 2 spoons of coconut oil. Make the mixture in a small plate and dip the brush and this time use a plate that has a lot of patterns which can be called “texture plate” Rub the brush on the texture and let them clean. Get a good soap for adults but make sure that you are aware that the soap can get dirty if you get one that is white in color. Let the water run down from the tap and rinse the brushes and start rubbing them on the soap till they are fully clean. This will work for the big brushes as well but may take some time and discolor your soap if you had lots of cosmetics on it. This is being used someone gets a piercing in their ears. They clean the ears so that excess germs do not clog the new holes. Get a small bowl and add the lotion soap, coconut oil and the dishwashing liquid you have in the kitchen. Put all your brushes in the solution and rub over your palm and rinse them gently. Get some shampoo on the brush and let them sit for few seconds before you wash them off with cold water from the tap. You can use any kind of shampoo but the herbal ones are preferred as you will finish off with a great smell. Get a cloth and a plate. Keep the brushes on the plate and let the wet part of the brush have its way out of the plate and the water is falling on the cloth. Keep the cloth under the plate. Another way is to get a board and attach 5 elastic bands in them. Insert the brushes and let them hang through the bands and keep the board somewhere where they will dry off.